The ACE Nimbus is the perfect outdoors companion. It may look like a futuristic folder, with its straight lines and subtle chamfering, but it is actually very true to the lines found in many Nordic tool knives. A strong, capable knife, with a sleek useful puuku-like blade profile, the Nimbus cuts like a dream due to the high full flat grind and thin edge. 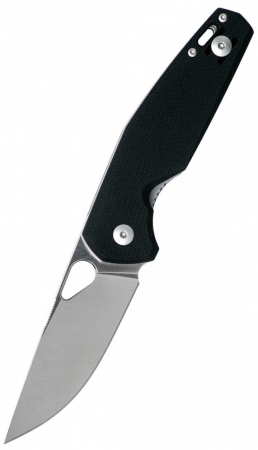 A modern looking folder with attitude and a ton of cutting power. Borrowing from the rugged, utilitarian design objectives of the Nimbus motorcycle, this knife is our take on a great “tool knife”. If you are looking for a trick knife to middle-finger flick and play with during office breaks, we have other options coming in the ACE-line. The ACE Nimbus is the knife you’ll want to keep in your winter coat, backpack, working jeans or toolbox. The sort of knife that will be there when you need it. The strong clip and grippy G10 will keep it secure in your pocket, and fill your hand in the way a good tool should. This is the kind of knife you will love to use for years to come.